Owen Guns Bulletin Alert No 2 Edition 60 Sept 2011. Home » Bulletin » Owen Guns Bulletin Alert No 2 Edition 60 Sept 2011. Welcome Sixtieth Edition of the Owen Guns Bulletin. 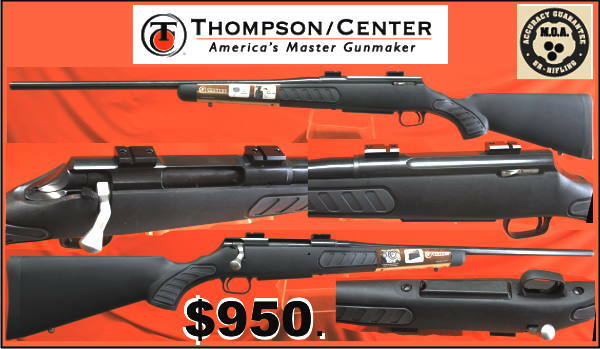 Instruction of how to access free gun books and manuals is at the bottom of this page. URGENT ACTION REQUIRED, FIREARM CONFISCATIONS. AGAIN YOUR SPORT IS AT RISK. YOU ONLY HAVE A FEW DAYS TO GET THE ATTENTION OF YOUR LOCAL MEMBER OF PARLAIMENT AND STOP HIM FROM VOTING IN THE INTEREST OF CRIMINALS AND AGAINST THE INTEREST OF THE LAW ABIDING CITIZENS OF QUEENSLAND. I even gave a sample form submission, and a sign to put up at your club or Gun shop. Now I have pictured one page out of the amendments. NOW READ Clause 44 And PLEASE THINK. The operative words, (those are the ones you get charged with in court) are the ones that define what will be the law come both political parties voting for it. 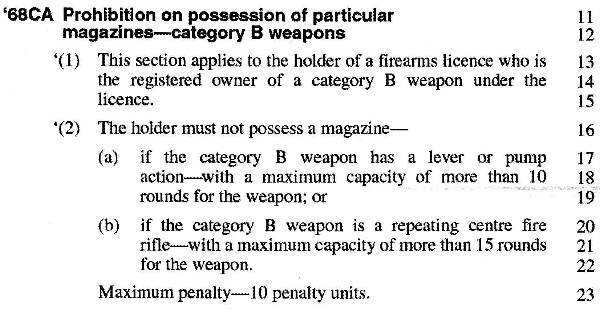 (b) if the category B weapon is a repeating centre fire rifle—with a maximum capacity of more than 15 rounds for the weapon. Maximum penalty— 10 penalty units. 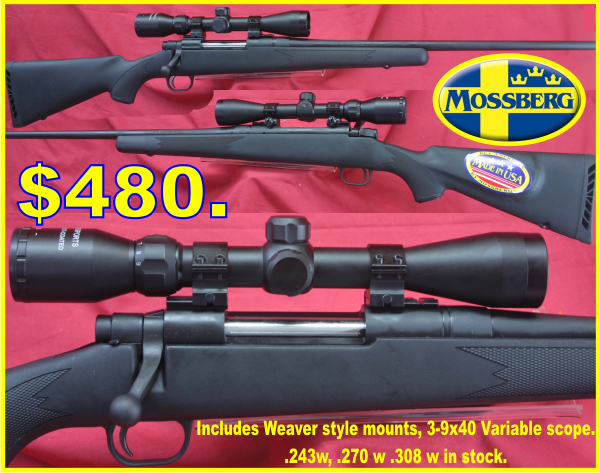 The Weapons Capacity not the Magazine, the firearm with its in built capacity tubular, is all magazine. 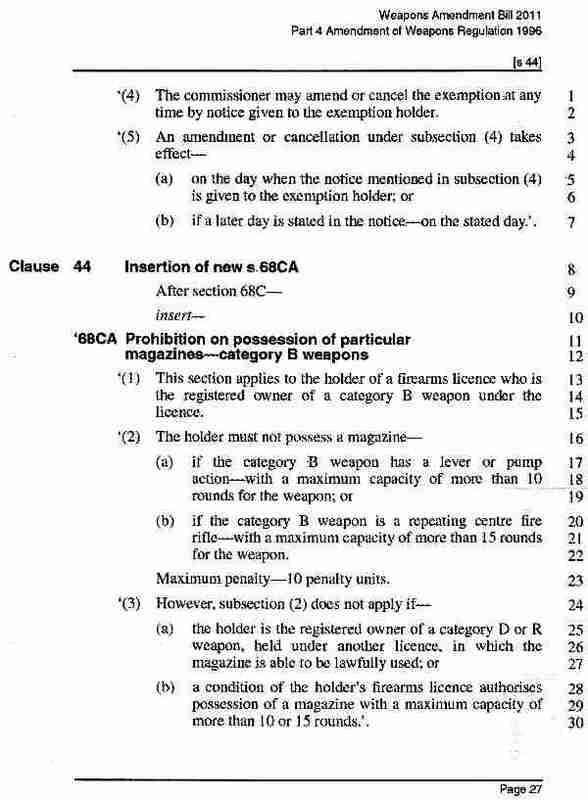 So if you have a detachable magazine for your pump or lever action which gives your weapon a capacity of more than ten rounds you can easily hand it in before the Bill is an Act of parliament and the local Police Station for no compensation. That is wrong, no proper legislator can justify taking property of the innocent shooter. 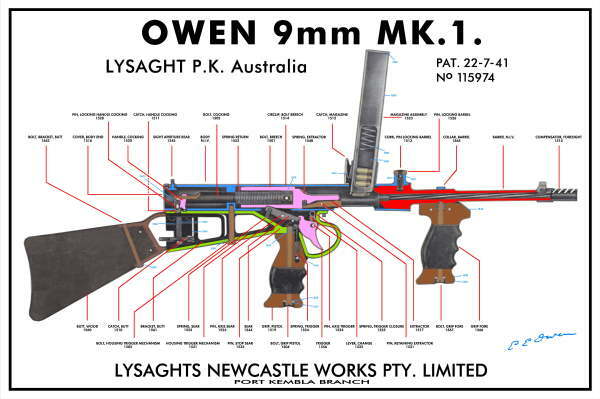 However, the thousands of shooters in Queensland who have in-built, tubular magazines which have a capacity of more than 10 rounds that they must not possess are a part of the weapon. There is no provision for crimping the tubes or shortening the tubes, or removing the tubes altogether. You cannot have it. It, the weapon has the capacity of more than 10 round, so the court can give you a 10 penalty point find and of course you have a conviction and lose all your firearms and licences. THIS PRINCIPLE IS IMMORAL AND SHOULD BE REVERSED NOT COMPOUNDED. Keep telling them this, try and get them thinking. Nothing in any of existing Weapons Acts are moral or can be substantiated as doing anything positive for the people of Queensland. So why do our politicians keep imposing them on us? More than likely you will not have a ten shot magazine or a rifle with more than 10 shot capacity, many of you say. Why should I do anything. 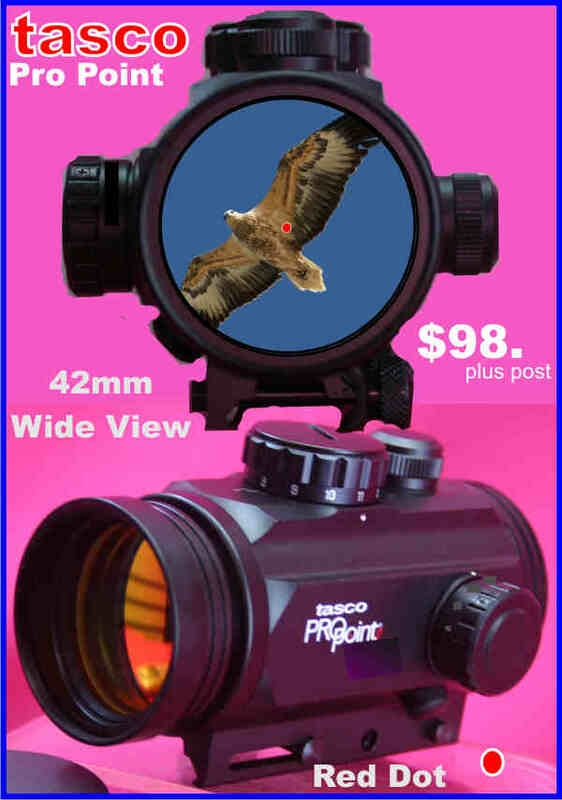 The Larger than life answer to that is that if you don’t, whatever you shoot they are going to get around to you and your guns or your knife or your laser, or your nightscope. For as long as these politicians can believe that they can get away with penalising the innocent law abiding shooter, by removing his property, fining him if he forgets, taking his licenses and all his guns of him, if he does not remember to sign the range register, then we will stay being the hunted, the prey, the sport of policemen wanting another feather in there promotion. Collectively Punishing the Innocent Fire Arm Owners, Ignoring the Criminals. Twenty years ago, we all made the mistake of accepting this oppressive legislation, I and a few others warned of its underlying mammoth problem. That is that it does not work, it does not change criminal behaviour it only imposes its cancerous hold on the law abiding, and of course does nothing to stop the causation of social problems. Criminals committing armed robbery are un affected, murders at home are un affected, home invaders increase as the general public are disarmed. So the parliamentary factories of legislation gear up and ban more of our property, limit more of our sport and hobby. They are horrified, scared to death of our growing numbers, scared of the power we have over them at the polls if we every realise that power and organise and unify. They are desperate to limit our numbers that is why they increased the fees 126 %, that is why they have these amendments, that is why they grant money to Large Shooting associations, which supply paid employment for Shooting association organisers. Naive, are shooters who expect there paid association organisers to reject legislation. Politicians put the Interests of Criminals before the interests of the Victim. When an 80 year old is beaten to death in their homes, by criminals for their pension money, some of them are ex rifle and ex pistol club members fully qualified with forty years of training, but have been disarmed. Have they got the right to defend themselves, even if they failed, they at least would have the right to defend themselves not just offer them selves up as a sacrifice for political correctness. The Party politicians are the enemies of Australians, they are the ones organising the break down of law and order. They are ignoring the cause, the armed criminals and instead of making the police prosecute the wrong doers, are imposing oppressive theft laws onto the law abiding in a fraudulent charade, making it seem like they are acting. Well they are acting, both sides of politics, with not a cigarette paper of difference between the parties or there individual members. They are all career politicians, once the have party pre-selection they have jobs and pension for life and so are totally dependent on the party. Only vote for independents, let them chose who governs when there is a balance of power. The Political Parties are all our enemies. Not Short on Cunning, they Know that All This Gun Legislation is Oppressive and Won’t make a Bit of Difference to Armed Crime. They know that if they have a drunk driver that drives into a supermarket and kills 10 people that it is useless banning cars, or banning alcohol they all fully aware that the driver has to be punished, he goes to jail, he loses his licence to drive, they might even have an educational campaign to prevent drink driving but never would they suggest banning cars, no matter how many were killed. They know it is correct that the law breaker, is punished not the thousands of innocent owners of the Cars, but when it comes to firearms they only know the immoral technique of stealing. And NO weapons were used in 85 murders, so hypothetically when they have taken all the guns, and they have taken all the knifes and we know from many sources BIS, Queensland Police http://www.police.qld.gov.au/Resources/Internet/services/reportsPublications/statisticalReview/0910/documents/Monthly%20Crime%20Trends.pdf that there has been a very slight decrease in the murder rate beginning in 1988 but it has only been a very slight decrease so the after cricket bats and rocks are banned, using the same logic as they have for the last 20 year just banning and oppressing the innocent, they amputate every man women and child right hand, when the murder continues at the same rate will they then legislate to cut all hands off. Ludicrous, of course but this is the logic they have proceeded with for twenty years. It does not work, so move on to the next, semi autos this time, Shotguns, next time, Pistols, the time after, knives, Toys, laser, there is no end to it. All to escape the Police from doing their job and prosecuting the bad guys. They cannot use any legitimate argument so insult us all. Why, Well the Way they see it we are all Bad Guys. We are fit for any treatment, They call us right wing red necks, Gun Crazy, they mock us, they slander us, call us right wing extremists, fruit cakes, gun nuts, they have been doing this since the 1970s. As they have no logic for their behaviour their only defence is to belittle us and to split and divide us. When you think of the freedom we have lost already and the freedoms we are still to lose many of us will remember the wars for freedom of the 20th Century, the wars to save our country and other countries from oppression and tyranny. We awake in the 21st Century to a world where we are discriminated against, there is Anti discrimination laws but none of them are for us, we cannot speak out there is no freedom of speech, you do not have the freedom to own property, you do not have the freedom to use your land for what you want to do on it. We are bound down by central planning and show your papers. These were the philosophies that our countries young men opposed, they went out to sacrifice their lives, for the freedoms we have given away for nothing. What a price they paid, how cheap are we, the gravity of our sloth, we use words like, won’t affect me I have n’t got one of them. I will sell mine and buy a camera. I wrote a letter last time. No one wants to put themselves out or sacrifice anything anymore. I am not talking to the 5000 or so that get this newsletter, most will not even have scrolled down this far. So untold thousands of Queenslanders will be robbed, thousands more will be denied to buy what they want and millions more will be next in the queue of handing in what ever the politicians believe they can take next. Unless you give them a good telling, Now. For more idea’s on your submissions, see my letter to an MP. Click. Over 84 titles to choose from includes free Ballistic Calculator, Manuals, Drawings Specifications and Instruction books.